Many Styles and Colors of Nose Jewelry to Choose From! Bioflex nose bone. The post is made of Bioflex, and the setting that holds the twist design is 925 Sterling Silver. 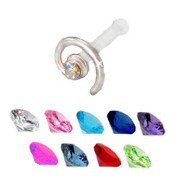 This 3mm Twist design features a 1mm gemstone in the center in your choice of color.